Are you on twitter? It can be a little overwhelming at first, what with everyone updating every detail of his or her lives onto a social media platform so vast. It does have its advantages though, so if you haven’t already, go sign up now! No, we’re not advertising for twitter. But if you love learning abut new hairstyles, see what hairstyles celebrities are wearing to their next red carpet event, hair health & care tips and just about anything else you want to know about hairstyling, really…twitter is the place to be. 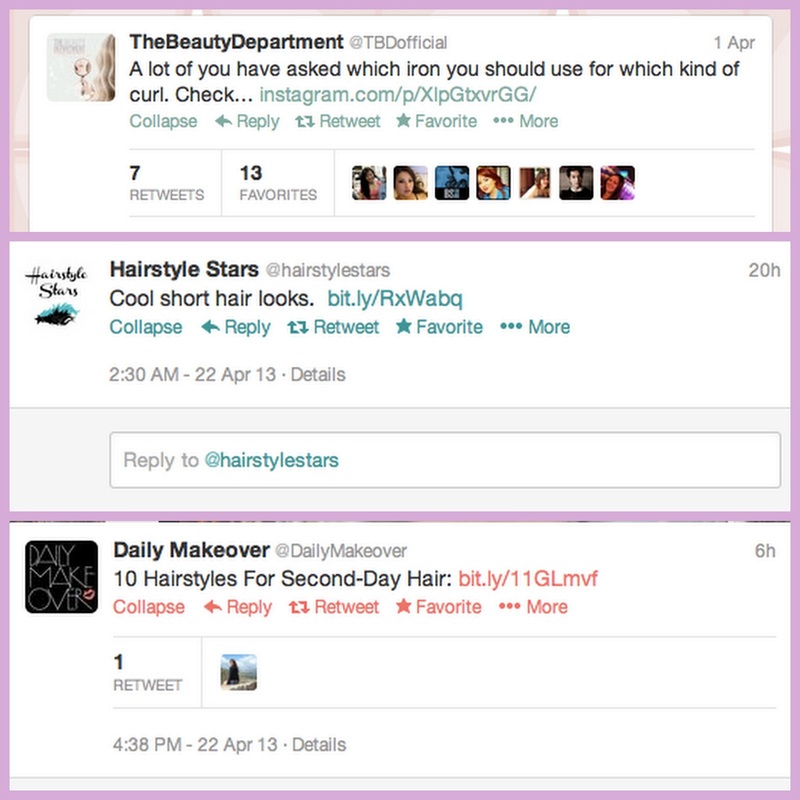 So we decided to make a list of must-follow twitter accounts for your daily dose of hairstyling. If you want to know which curling iron will give you the kind of waves you need, if you need inspiration for your next haircut or if you just want a preview of how all the stars will be wearing their hair to the next red carpet event…these are the accounts to follow. 1. Jen Atkin (@atkinjen): Hairstylist to some of Hollywood’s A-listers, Jen Atkin’s twitter page is positively star-studded. Follow her if you want a little backstage peek into the lives of Jessica Alba, Kaley Cuoco, Khloe Kardashian, Sofia Vergara and many many more. You’ll get the chance to see red carpet hairstyles in the making and even pick up plenty of hairstyling tips. 2. The Beauty Department (@TBDofficial): Launched by celebrity Lauren Conrad, Kristin Ess and Amy Nadine, you can follow tweets that’ll show you what the latest trends in hair colouring are, which curler you should use to get the curls you want and hundreds of more styling tips. The hairstyling section of the account is handled by Kristin Ess, another celebrity hairstylist (whose twitter account is also pretty amazing). 3. Hairstyle Stars (@hairstylestars): A no-nonsense account that will give you all the information you in short, concise tweets. ‘Long hair down hairstyles for special events!’ and ‘Best bangs for your face shape’ are just some of the topics they’ve recently tweeted about. This is one of the most informative, precise accounts out there. 4. 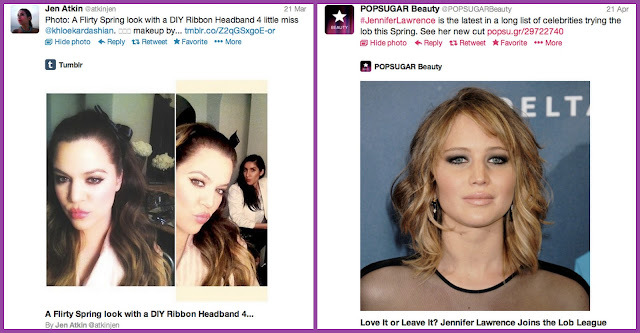 Daily Makeover (@DailyMakeover): These guys are have brought in a cornucopia of hairstyling trends and tips to twiiter. Along with tweets about hairstyling, you’ll find that beauty is also on top of their list. Recent tweets include ‘No more flat hair!’ and ‘How to trim your own bangs’. 5. POPSUGAR Beauty (@POPSUGARBeauty): The POPSUGAR Beauty team from San Francisco, LA and New York tweets about a lot of celebrities. A lot. These tweets are also mixed in with hairstyling tips like, ‘Tired of your hair color fading? These products are the secret to prolonging your highlights and all-over color’, followed by a link. These 5 twitter accounts will have you fully up-to-date with what’s going on in the hairstyling world and sometimes in the beauty world too. Now it’s super easy for all you beautiful women to get your fill of celebrity hairstyles, red carpet hairstyles and ‘How To’ posts delivered right to your phone!